The Five of Pentacles represents a period of adversity in this path of the Minor Arcana. This suit deals primarily with financial and career issues. It represents a period of poverty or falling backwards in our career path. It can represent a time of isolation from our team-mates, and an insecurity in the time of our project. 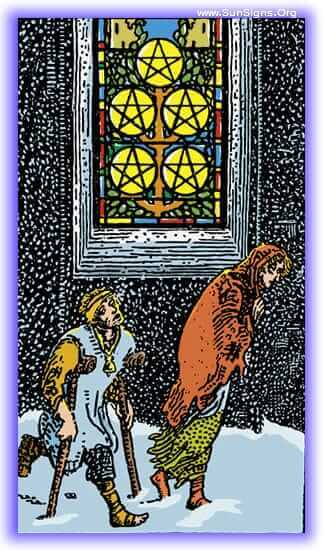 The Five of Pentacles arrives when we find ourselves in a situation where we’re having difficulties with money or property. It may be unbridled greed, a loss of land or home, perhaps even a vehicle. The financial difficulties can include our relationship to money, spending it too freely, or hoarding it unnecessarily. It can also include a lack of self-confidence in one’s ability to take care of themselves. The past has been hard financially, things have just not been working out. New jobs have not been available, and things have just been overall difficult. The Five of Pentacles in this position indicates that you’re having a hard time relating to your finances. You may be feeling like you can’t take care of yourself, and this disheartening feeling is really dragging you down. If you are otherwise stable, you may be shepherding your money a bit too tightly, suffering a bit from the ailment of those folks who went through the depression. It’s time to start taking care with your money and finances. If you have anything to save, now is the time to do it, this tarot card in your future heralds a financial hardship, possibly the loss of income through the end of employment. Start saving for it now. 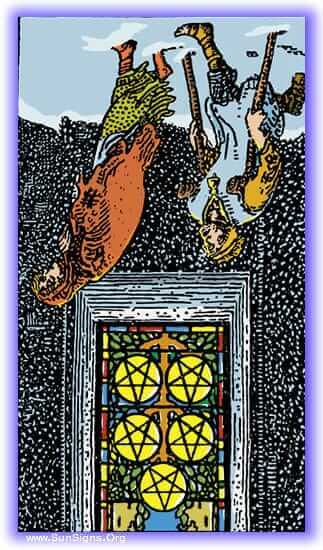 The Five of Pentacles reversed indicates that your times of financial hardship may be coming to an end. The arrival of a new job, or someone to take care of you while you work to become independent. The struggles of dealing with low self-esteem and an inability to take care of yourself may finally be coming to an end. You’ve recently received assistance to help you through the struggles you’ve been having. Wherever this has come from, know that it is a blessing and take full advantage of the opportunity it’s provided. You’re finally beginning to find yourself a little bit of stability. Something has happened that has increased your self-esteem and has provided you with an opportunity to take care of yourself. Keep working and you’ll soon see your way out of this mess. If you’ve been looking for employment for a long while, know that your search is about to come to an end. It may not quite be in the way that you anticipated, but it will free you up from the bindings of poverty that you’ve been dealing with. Take heart, your time of hardship is on it’s way out.